Researchers at Indiana University have shown that an artificial intelligence framework that employs sequential decision-making could reduce health care costs by over 50 percent while also improving patient outcomes by over 40 percent. Bloomington, Indiana — New research from Indiana University has found that machine learning — the same computer science discipline that helped create voice recognition systems, self-driving cars and credit card fraud detection systems — can drastically improve both the cost and quality of health care in the United States. Using an artificial intelligence framework combining Markov Decision Processes and Dynamic Decision Networks, IU School of Informatics and Computing researchers Casey Bennett and Kris Hauser show how simulation modeling that understands and predicts the outcomes of treatment could reduce health care costs by over 50 percent while also improving patient outcomes by nearly 50 percent. The work by Hauser, an assistant professor of computer science, and Ph.D. student Bennett improves upon their earlier work that showed how machine learning could determine the best treatment at a single point in time for an individual patient. “The Markov Decision Processes and Dynamic Decision Networks enable the system to deliberate about the future, considering all the different possible sequences of actions and effects in advance, even in cases where we are unsure of the effects,” Bennett said. Moreover, the approach is non-disease-specific — it could work for any diagnosis or disorder, simply by plugging in the relevant information. The new work addresses three vexing issues related to health care in the U.S.: rising costs expected to reach 30 percent of the gross domestic product by 2050; a quality of care where patients receive correct diagnosis and treatment less than half the time on a first visit; and a lag time of 13 to 17 years between research and practice in clinical care. Bennett is also a data architect and research fellow with Centerstone Research Institute, the research arm of Centerstone, the nation’s largest not-for-profit provider of community-based behavioral health care. The two researchers had access to clinical data, demographics and other information on over 6,700 patients who had major clinical depression diagnoses, of which about 65 to 70 percent had co-occurring chronic physical disorders like diabetes, hypertension and cardiovascular disease. Using 500 randomly selected patients from that group for simulations, the two compared actual doctor performance and patient outcomes against sequential decision-making models, all using real patient data. 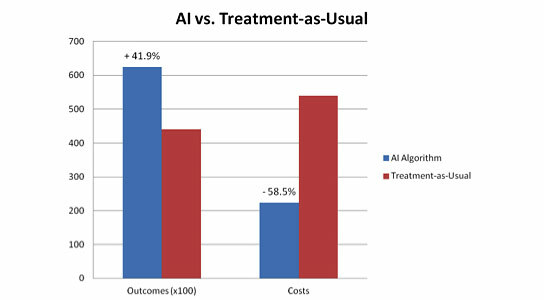 They found great disparity in the cost per unit of outcome change when the artificial intelligence model’s cost of $189 was compared to the treatment-as-usual cost of $497. While most medical decisions are based on case-by-case, experience-based approaches, there is a growing body of evidence that complex treatment decisions might best be handled through modeling rather than intuition alone. Using the growing availability of electronic health records, health information exchanges, large public biomedical databases and machine learning algorithms, the researchers believe the approach could serve as the basis for personalized treatment through integration of diverse, large-scale data passed along to clinicians at the time of decision-making for each patient. Centerstone alone, Bennett noted, has access to health information on over 1 million patients each year. Be the first to comment on "AI Framework Predicts Better Patient Health Care and Reduces Cost"